The Free Fuzz was patterned after a rare and sought-after silicon transistor fuzz pedal made famous by players like Jimi Hendrix in the late '60s. It provides a wide range of creamy, dynamic fuzz effects with an almost endless amount of sustain for soloing and chunky rhythms. The Opto Stomp is a transparent optical compressor that provides a wide range of soft-knee compression effects, reminiscent of the best vintage compressors made in the ʻ60s. The Soul Vibe is a vintage vibe/rotary speaker simulator known for its chewy phase-like textures made popular in the late ʻ60s and ʻ70s by such players as Jimi Hendrix, David Gilmour, and Robin Trower. The Tremor is a dual-mode Tremolo/Auto-Pan that utilizes an optical circuit to create a wide range of warm pulsating sounds normally associated with the "vibrato" effect of vintage tube amps. The Tremor ʻPlug-Inʼ offers the flexibility of two independent effects that are foot switchable (to keep the original hardware look), enabling a player to select between a Tremolo effect and Auto-Pan effect. 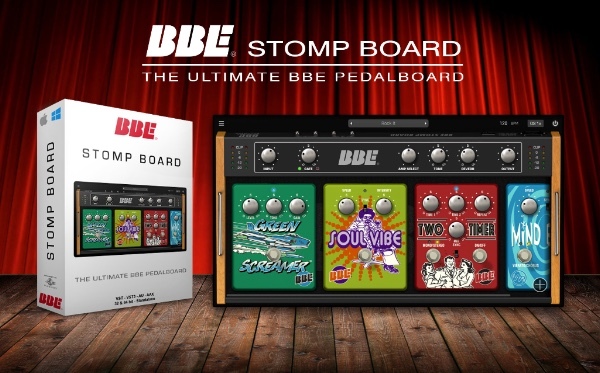 BBE Sound Stomp Board is available now from all global resellers and music stores listed here at Plugivery.